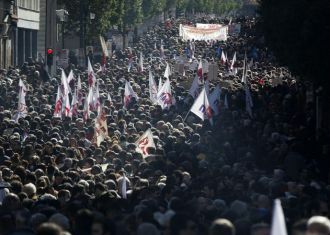 Tens of thousands of anti-austerity demonstrators, who included members of the pro-communist union PAME, gathered during a protest in Athens on Wednesday, Feb. 20, 2013. Perhaps 40,000 filled the streets of Athens as unions staged a massive general strike to protest government spending cuts and tax hikes. It is widely criticized that these austerity measure will send unemployment running up to 30 percent. This is why Obama wants to get rid of guns. He knows the same thing will eventually take place in the United States. It is more than just austerity where they face reduced pensions. The government is cutting salaries while also raising emergency taxes dramatically altering the balance of civilization. This is the problem with Socialism – they promised the Moon, but never funded it. We are now seeing the contest of paying bond holders their pound of flesh. The easiest way to destroy a nation is to lend it money. The Greek people are reaching the point where there is no tolerance left, and these insane austerity measures with higher taxation are placing at risk the complete breakdown of society through civil unrest, revolution, and lays the seeds for World War III raising tensions and old wounds. Without a complete restructuring of the world economy, we face the breakdown of civilization itself. We will review this at the upcoming Sovereign Debt Crisis Conference in Philadelphia on Saturday March 16th. « Thank You – There is More to Come – Currency Collapse?